The San Antonio Social Security office is located in San Antonio 78216. The following page includes information for this location like the office phone number, hours of operation and driving directions. If you have any interests or comments about your retirement benefits or are interested in making an appointment, call the following San Antonio Social Security office. The San Antonio Social Security office is located in San Antonio 78216. The following page has information for this location like the office phone number, hours of operation and driving directions. 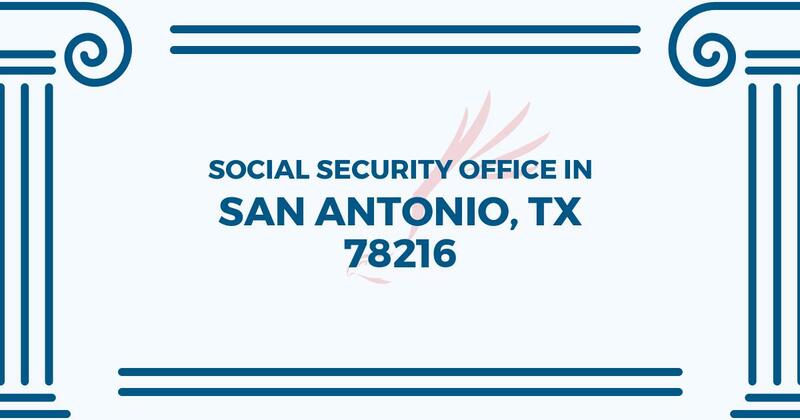 If you have any requests or worries about your retirement benefits or are interested in arranging an appointment, call the following San Antonio Social Security office. I have missed placed my SS card in my home and can not locate it right now. I work as a care giver and a new company is taking over our old company and they want to see my card and I just can not find it. Please tell me what I should do and can you please help me. Thanks so much. Lidia Rodriguez 210 2748357. The staff is Nice and their service is worth for appreciation. People may dislike the restrictions set by the SSN office, but people should understand the security issues. I hv no personal issues either with the staff or with the restrictions implimenting by them. One thing i want to suggest here is that, there should b some provision to sit for elderly,physically ill n challenged people. They can’t stand till the doors being open. *Those who aspire to apply for SSN should not carry weapons r arms(even small knives),food,Beverages,fruit or alcoholic drinks. *No Belts are allowed to be worn. *One must maintain their cellphones either in silence or in switch-off mode. *Cellphones should not be used either for conversation or for taking any kind of pictures in SSN office. *People without following the above are not allowed to apply for SSN. *Those who want to enroll for SSN in that day should reach SSN premises 2 and 1/2hrs prior than the established time 9AM. *I was shocked in looking a huge line before 8AM. I received 2phone calls from 12108889335 stating my ss account was being fraudently used.it is apparent to me the calls are fraud, trying to obtain my info. you need to notify the atty gen immediately. I got one of those calls too. They are bogus, right? I’m getting the same phone calls, today. This is a fraudulent call, right? 12107673194 is the number that called me. Said someone used my number for tax evasion. I know nothing about any of this. But they wanted all my information. I didn’t respond. Just hung up. The day I went to the Social Security office there was ample seating in the waiting room. I got there around 1 p.m. without an appointment and was able to speak to a representative around 3 p.m.. they were helpful and courteous and answered the questions I had about my social security disability claim. I was grateful for the guidance with completing and submitting the proper paperwork. Being a military veteran I am used to waiting and did not consider this way to be extreme. Always polite and helpful thank you! I live in Roanoke, VA, and I have recently retired from the Roanoke OHO. I received a call this afternoon, 16 April 2019, from 210.361.4653, and someone alleging to be in the San Antonio SSA Office, who informed me there is a “problem with (my) benefits”. I told them I was a former employee of SSA and that SSA NEVER calls individuals regarding benefits, but sends letters via the US Postal Service instead, and has the individual contact the office. They immediately disconnected the call. Please be aware that this is going on in your area.